(Mark Hachman @markhachman) Well, there’s apparently one good thing Microsoft’s Windows is good at: running the software necessary to manufacture Apple’s Mac computers. The problem? Right behind Cook is an iMac—and it’s clearly running Windows. Cook apparently didn’t notice his glitch. This could be a case of Twitter naivete, as Cook only has 64 tweets to his name, and he may not realize the full impact of his Twitter megaphone. His photos are favorited and retweeted thousands of times, but just a few people noticed the Windows issue. Those people, however, began commenting upon it. 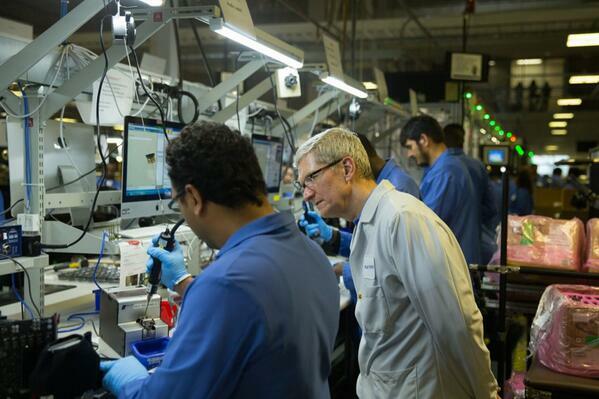 “Made in America, with Microsoft Windows (look closely),” Steven Webster tweeted. “@PeterrWLFC @ryandolan123 Macs are made on Windows which then allows android to be made on the mac. :)” user RBXcmn65 added. It wasn’t totally clear whether the PC in question was running Windows XP or Windows 7, although most commenters were leaning toward Windows XP. It also wasn’t clear what application it was running. It’s certainly possible that Windows was being used to run electronic design automation (EDA) software, or some other embedded analysis program that Apple’s developer base has passed over. What is clear, however, is that Apple’s airtight PR machine sprung a leak, and right from the very top. Ironically, Cook himself took some potshots at Microsoft during the Apple’s WWDC speech, mocking Microsoft for poor customer adoption of Windows 8 relative to OS X Mavericks. “This is the fastest adoption ever of any PC operating system in history,” Cook said of Mavericks. Maybe so, but Apple’s assembly line could certainly use a copy.